Mobilians love to throw a party and we celebrate just about everything. On an given day, you&apos;ll find festivals, concerts, street parties, art shows, symphonies, sporting events...just to name a few. 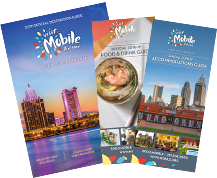 There&apos;s something to do all the time in Mobile, don&apos;t plan on being bored when you&apos;re in town! Scroll down the page for some of our most popular events or click to access our complete Calendar of Events.